The private INFINITY STUDIO offers easy access to the Infinity Pool and is surrounded by lush Tropical gardens just a few steps down from our car parking and reception area. The accommodation is very popular with our guests and is the 3rd most highly awarded accommodation in Bequia. Bearing in mind there are a few hundred vacation rentals on Bequia and that the 1st and 2nd most awarded properties are both part of Tropical Hideaway, being 3rd is a tremendous achievement. The accommodation is simply stunning and offers a combination of luxury, privacy, space and affordability that is hard to come by these days. The room measures around 9m (30') in length and nearly 5.8m (19') wide and is very spacious. The views from the veranda are spectacular. A solid oak, queen size, four poster bed is positioned centrally in the room and to the right of this is a small kitchenette complete with sink unit, 2 burner gas hob, fridge, combination microwave oven, toaster, kettle, cafetiere, espresso maker, blender and a complete range of high quality cooking utensils, crockery and cutlery. An ice bucket is supplied and complimentary ice is available from the Pool Bar icemaker or the staff. A spacious en-suite toilet and shower room leads from the living area and this has oak furnishings with granite tops and luxurious fittings throughout. Walls and floor are finished using natural coral stone tiles. The shower has a built in seat and is finished in natural stone pebble and coral to a very high standard. A window looks out over tropical gardens and the harbour. A complimentary range of organic bathroom toiletries are provided, together with top quality luxury bath linens, robes and pool towels. Two pairs of patio doors lead onto colonial style covered veranda's with archways above, ensuring the room remains cool and bright yet protected from strong sunshine and any passing tropical showers that keep the gardens colourful and vibrant. The surrounding stone decked patios include an authentic Thai cartwheel coffee table with views of St Vincent island, Admiralty Bay, lush tropical gardens and the surrounding forested hills. 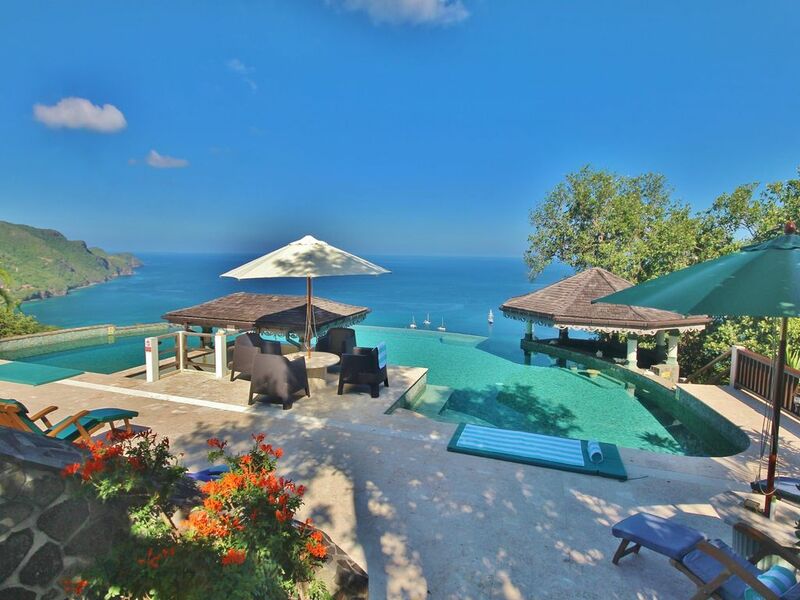 Another patio has stunning views looking out onto the Infinity Pool and the Caribbean Sea. A bistro style breakfast table is positioned here allowing you to dine Alfresco style in beautiful surroundings. You can also relax in a lovely hammock swinging under the arch. We originally arrived in the Caribbean in 1996 after making a 3 week transatlantic crossing aboard our sailing yacht 'Rainbow Spirit'. This was the beginning of another adventure and after sailing and exploring the Caribbean Islands for 2 years we eventually bought a 2 acre plot of land on the island of Bequia. Having already committed to a world circumnavigation, we set sail again in 1998, went through the Panama Canal and spent the next three years travelling around the world with our three daughters. Although we visited hundreds of white sand, sun-drenched tropical islands, we found none of them compared to the special beauty and charm of Bequia. We returned in 2001 and finally made a start on building our 'Tropical Hideaway'. Building in the Caribbean was never going to be easy and after the frustrations of 2 years turning into 3 years and 3 years turning into 4 years we finally finished construction in 2011. Eight years of full time building and a cost overrun of around 300%. The project was huge, far bigger than we ever imagined, but our hard work, frustrations, pain and suffering eventually paid off and we now have a remarkable property often quoted as having 'the finest views on Bequia, from the finest accommodation on Bequia'. Our daughters have now left to start their own lives and adventures, returning when time and funds allow. Our eldest daughter is now married and lives in New Zealand. Our middle daughter started the first Spa's and treatment centres on Bequia and is now employed by the rich and famous from all over the world. Our youngest daughter is currently working at a safari lodge in a remote part of Zambia and returns to Tropical Hideaway for the December to April season where she offers her spa treatments and therapy work. As you can see, our wanderlust lifestyle has left a lasting impression on our daughters and they are all enjoying an adventurous and exciting life as we have done. Tropical Hideaway and the Infinity Studio have one of the finest hillside locations on Bequia and coupled with the incredible heated Infinity Pool, the spectacular panoramic ocean views & the beautiful evening sunsets, you soon realize you are enjoying, what many say, are the finest views on Bequia, from the finest accommodation on Bequia. The views are simply amazing and are forever changing as ships and yachts of all sizes and nationalities pass by on their journeys and adventures. Having two dive shops and around 24 dive sites, Bequia is a divers paradise. Our diverse marine environment includes relaxing reefs, wall dives, drift dives and even a few wrecks. You can still dive and snorkel away from the crowds in crystal clear waters with reefs that are still pristine. Our abundant and diverse sea life ranges from 100’s of species of Tropical Fish, Octopus, Sea Turtles and Sea Horses to name but a few. Bequia has it all and will satisfy beginners trying out snorkelling, scuba divers who wish to take a Padi course and experienced divers wishing to go on an exhilarating dive. Looking for an adventure? Try Discover Scuba with one of our two dive shops and enjoy a shallow reef dive with one of their experienced instructors. We now have available our brand new forty page 2016 guidebook about Tropical Hideaway and the Island of Bequia. It has detailed information about local services, the fun things to do, our local restaurants, day trips to nearby islands and a wealth of other information invaluable for anyone intending to visit our beautiful Island. To read our complimentary guidebook please go to the very bottom of this page or visit our comprehensive website, read our latest 5* reviews, browse through our stunning photographs and download our complimentary 2016 40 page information guide for visiting Bequia and make your dream a reality. Luxury rattan style furniture provides a very spacious and comfortable seating area. The views looking out onto the veranda are beautiful. All rooms are fully screened against mosquitoes etc. A cafetiere and espresso maker are supplied. The small well laid out kitchen has a sink unit, 2 burner gas hob, fridge, microwave oven & grille, toaster, kettle, cafetiere, blender & is ideal for the preparation and cooking of simply meals. Verandas include a bistro dining table and chairs. Dine alfresco style with beautiful surroundings. You can spend hours just looking at the views. All rooms have covered patio areas with stunning views and outdoor furniture. There simply are not enough superlatives in the English language to adequately describe our experience at Tropical Hideaway & our time on Bequia. We had 9 absolutely glorious nights on Island with Tropical Hideaway as our home. From Julie's smile greeting us at the airport & Martin's (much appreciated after a long day of travel) arrival rum punch (best on Island, BTW), our experience just kept getting better and better. Throughout our arrival tour of the property, our "WOW's" kept getting bigger with every step and turn of a corner. As we entered the infinity pool area, I was truly rendered speechless. I have to admit the overwhelming beauty of TH & our view of Bequia got me quite misty eyed on more than one occasion. We chose the Infinity Studio for our stay, and we could not have been happier or more comfortable. It was spacious, beautifully decorated and had been immaculately cleaned (they have a wonderful staff for housekeeping, cooking and gardening). We fell asleep every night with the 2 screened sliding doors open to the sound of Mother Nature. We never needed the AC. The welcome pack of sundries and groceries included with our 9 night stay was incredibly generous. We both love to cook, and we ended up enjoying most of our meals prepared either ourselves with items purchased throughout the week from the TH on-site store or with the delicious, ready-made meals prepared on site at TH (our favorite was the fish curry & plantains). We ate each of these meals al fresco on our private patio. We learned to use a french press for our morning coffee. Martin & Julie have thought of EVERYTHING. One of my very favorites, besides the infinity pool, lush & tropical landscaping, rum punch and Hairoun, is the plethora of music they have on their server, which we listened to in our room every single day. I HIGHLY recommend that you make the time to have a group dinner with Martin & Julie and the other guests for sharing a great meal and fellowship and to hear some of their sailing adventures and their story of pouring their hearts and souls into Tropical Hideaway. My husband and I had planned to vacation in St. John, USVI, in March 2018. However, after the island was the direct hit of 2 hurricanes in the fall of 2017, we started looking for an alternative destination. Having been to Bequia for a day about 15 years earlier while on a Windjammer cruise, we became intrigued with the idea of returning. The smallness and intimacy of the island held a definite allure. While researching lodging possibilities on Bequia, we found the website for Tropical Hideaway and looked no further! The property if fairly new and boasts a beautiful Infinity Pool overlooking Port Elizabeth. We stayed in the Infinity Suite, one of only 5 units currently on the property. The suite was large, comfortable, beautifully decorated and provided more storage than anywhere I have ever before stayed! Each unit has a kitchenette which we used to prepare a couple of breakfasts and dinners. The property has a store supplied with fresh foods, frozen entrees, alcoholic and non-alcoholic beverages and other items to serve their guests. Our room was just steps away from the Infinity Pool and deck area. Needless to say we took advantage of the Infinity Pool with it's stunning view of the town and Admiralty Bay, the pool bar, deck and cabana areas. Tropical Hideaway is so lovely, quiet and relaxing that we chose to stay at the resort a couple of days to decompress and enjoy the tranquility. The hosts at Tropical Hideaway, Martin and Julie, do an excellent job of creating an atmosphere where guests get to know one another, watch the sunsets together from the Infinity Pool, and enjoy each other's company. A hike or taxi ride down to town or beaches gives an opportunity to appreciate the local culture and many fine restaurants and bars. Sailing, snorkeling and scuba trips are all available for those who are interested. The 7 square mile island of Bequia is clean, friendly, safe and a haven in the Eastern Caribbean! Tropical Hideaway must be one of the finest properties on the island with hosts Martin and Julie way ahead of the curve in providing everything necessary for a perfect get-away. We would love to return and spend more than a week next time! Un lugar increíble!! La vista y comodidad de las habitaciones es insuperable. La piscina tienen que verla por ustedes mismos. La recepción y amabilidad de Martin y Julie es sorprendente. Realmente recomendamos este lugar a cualquier persona que busque un lugar lindo y tranquilo. When we saw this view for real...it seemed like heaven will be! Great covered lounging bed overlooking the sea and a pool to die for will always be in our heads. Lucky to have spent a week here! The property itself is beautiful. The studio we stayed in was large and ample. The pool unimaginably beautiful and the best for me, the covered gazebo full of large pillows and cushions to read your book or stare out at Admiralty Bay. Not any better than This! Like many have already stated, the Tropical Hideaway villa is an absolutely fantastic place to spend a vacation. Martin and Julie are extremely welcoming hosts & owners, that have put an enormous amount of thought into every detail throughout the villa. I am almost somewhat hesitant to write this review, as I want to keep it secret! As the location is somewhat remote, the villa features a well-stocked pantry with everything you could buy locally at a grocery store. This is incredibly convenient and the vacuum packed meals are of the same quality you can have made at a restaurant down in the bay. The views from the infinity pool are spectacular and one can easily get lost in observing the ships in the cove and watching the sunset every night. Overall, one of the best places my wife and I have stayed on vacation. Beautiful Bequia (pronounced bek way) is an undiscovered paradise, the Caribbean of 20 years ago. Covering an area of only 7 square miles, Bequia lies in the warm tropical waters of the Caribbean Sea. It is just a short plane hop from the ever popular Barbados and next to the renowned Mustique, both favorite islands of the rich and famous. It is the largest of the Grenadine Islands known also as the ‘jewels of the Caribbean’ and is blessed with several pristine, white sandy beaches, many of which are totally natural and undeveloped. If you want resort hotels, nightclubs and beaches full of sunbeds, don't come to Bequia. If you want to discover the undiscovered, visit our beautiful Island, enjoy the uncrowded, pristine, white sandy beaches, swim and snorkel in our safe and warm Caribbean waters and experience the genuine friendliness of the local Bequian people.